On Monday 27th June 2016, we took our third trip down to West Bay leaving at 1am in the morning to avoid the traffic but it got us there just after eleven after making several stops on the long 300 mile journey. 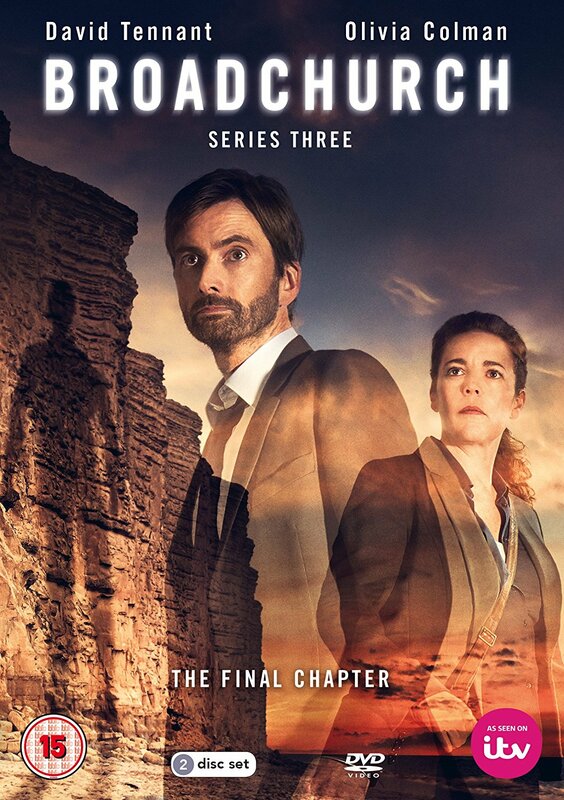 I quickly located where the film crew were based (the same place as last time) and saw a large platform with some lighting attached by a beach cafe and after asking some people already there, was told David Tennant wasn't due to begin filming until around half past four. I went back and hung around the cafe and began talking to some of the film crew, one told me what time David was really arriving and soon he walked past me to get inside the cafe. Another crew member then told those watching we would be better off around the other side as they were filming outside on some decking, which we did and got a much better view. Watching them rehearse then do the actual filming was really good, I kept trying to get closer for a better look and always stepped back while they did the actual filming but as it was winding down, David was talking to someone he seemed to know from a while back and I got a few close-ups of him. Then he was just about to leave and I called after him to ask him for a photo, he must have seen me taking the others and never objected. He turned around and said it was ok and stood and smiled for me before hurrying off back inside the cafe. Then Olivia Colman was leaving with Jodie Whitaker and someone else so I asked her for a photo and at first I thought she either hadn't heard me or didn't want to but she turned back and smiled for me. It really made the long journey worthwhile! for obvious reasons, these photos are special to me so I'm not sharing them. They were filming up in the town of Bridport the next two days, so I didn't see any more until Thursday afternoon when they were outside the exterior of what is used for the police station so from around three until seven thirty, there I was watching again as David filmed some scenes with his on-screen daughter. David was making everyone laugh by running back up the steps and doing a little dance on his way back inside the building, to which everyone clapped! Olivia Colman came along later and the filming crossed the road to the outdoor catering area and I got so close to them at times as I went to one of the food stalls, David was inches away from me but as they were filming I couldn't take any photos, only when they were between takes or rehearsing. more personal to me as I at least got photos this time and managed to get to speak to them both if only to ask them for photos. It was so much better this time, the crew were very friendly and I talked to them, they were giving hints when David would be arriving and where he would be and they never stopped anyone taking photos when there was no filming going on which made a huge difference and they were laughing and joking with the crowds but not once were we told we couldn't approach the actors as long as it wasn't when they were filming or rehearsing. All in all in my three trips down there, the journeys took hours each way and we did 1800 miles just there and back so if that is not dedication and determination, then I don't know what is. I didn't think I would get there this year, my husband was refusing to take me again but he got a new car and his excuse was it needed a good run! On , Monday 6th October I took my second trip to West Bay in Dorset with my husband, my daughter and her friend as I knew they were still filming the second series of Broadchurch. We had been a few weeks earlier and although we saw the filming vans, there were no signs of any of the cast as I wanted to see David Tennant (naturally) and was so disappointed I persuaded my husband to go back. It was a 600 mile round trip! 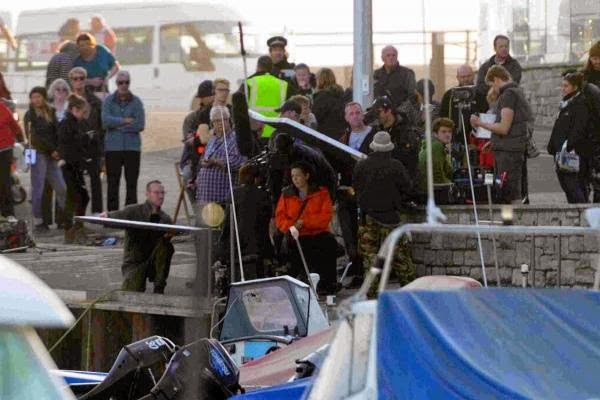 After setting off early on Monday morning, we arrived in West Bay and went towards the car park to park up until we could check into the caravan park right on the harbour and as we went back around the mini roundabout, we saw something going on outside the location used as Broadchurch Police Station to find they were actually filming! We drove past, I didn't see David Tennant but they were setting up so we parked on the seafront and I went back, turned around to face the steps and he was standing there! I stood directly opposite, no-one was allowed on the other side of the road and no photos were allowed and I watched him filming and rehearsing for about 40 minutes. I had to go check-in at the caravan park but went straight back and thankfully he was still there, still on the steps then he crossed over to a wall opposite and walked right past me and sat down. I tried to get nearer but one of the crew asked me to go back but he was just sitting there. Then they started filming again for about another 50 minutes. I'm in the picture above, it was as close as I could get but the photos below, I was actually stood pretty close to him though no-one was allowed to actually approach him. Below are the stills taken from series 2 episode 8 that I saw actually being filmed. It was the best day ever! It's my favourite episode out of both series, to have seen it in real life. There were a lot of similar shots so I just picked out the best ones. The photo below, I was standing a few feet to the right. These photos, I was just to the right of the wall, watching him walk across the road. These next two, I was just across the road. This one, I was watching just to the right again.